»The distribution is designed to help you store and play your music files from a server, which you can control from any machine on the network using a web browser. 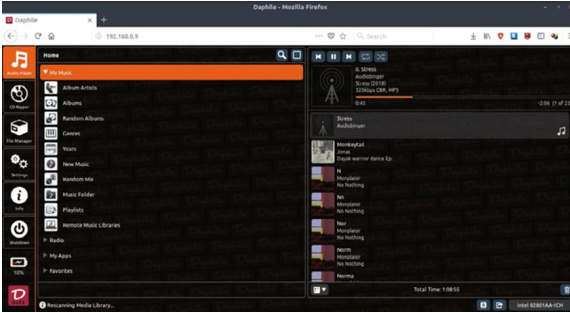 The music files must be hosted on the server itself, which makes Daphile different from music streamers such as Airsonic. Daphile identifies itself as the heart of a digital music system. It’s designed to help you play your collection of music files, rip CDs and even tap into radio stations, all from the comfort and convenience of a web browser. It isn’t, however, a conventional music streamer. Another feature that makes Daphile convenient to use is that it doesn’t require installation. You can burn a CD or use dd to create a Live USB of the 200MB ISO and that’s it. The distribution ships with all the tools and codecs required to help you play the music files that are already stored on the local hard disk. The biggest drawback for the distro, however, is its licensing model. While there’s no mention of it in the FAQ. the wiki or anywhere on the official website, a brief post by the sole developer on the DiyAudio forums reveals that the distro is “mostly based on open source (about 200 different packages). Everything that I have contributed by myself is proprietary and closed source”. Still more surprisingly, another post reveals that. “The source code is not distributed separately through Daphile web page. Daphile is build using mostly the standard Gentoo ebuilds. If you want the package list contact me through the Contact form in www.daphile.com and I’ll send it to you. Some parts of Daphile that I have developed by myself are not open source”. Unfortunately, the project doesn’t support ARM devices and there’s no word on whether these would be supported in future releases. zero set up initially caught our fancy, but its haphazard licensing approach might not sit well with some users. If Daphile manages to detect and configure your network card, then the distro boots into a screen that shows the Daphile logo, along with a message that reads “Ready. Use the Web Interface. IP address: 192.168.0.8.” There’s no means of accessing any element of the distro, except to use the web interface. The interface defaults to the Audio Player, which is the first tab on the sidebar. There are tabs for File Mangers. Settings. CD Ripper and more. The two- pane Audio Player lists all available music, be it media files, radio stations and so on in a pane on the left. The file or station you play is displayed on the right pane. You can use the search bar at the top of the left pane to look for files. It supports searching by file, artist name, tags, and various other elements, but couldn’t locate any files during our tests. When running the Live environment, you can’t change any of the default settings as Daphile reports that it’s running in a read-only mode. This means that you can’t configure the system to access Music files on other machines on your network using the CISF, SSH, NFS or FTP protocols. If you want the ability to tweak Daphile’s settings, you have to install it to disk. But for this, you must have a spare disk with no other partitions on it. In the web interface, click the Settings button on the sidebar and then scroll down to System Firmware and choose the disk to install it to. Unlike other Linux distros. Daphile doesn’t let you add/remove software even after installation. Once installed, you can configure the music directories on different machines from the Settings>Networking menu. If all goes well, the internal devices, as well as network shares will be accessible from the file manager. Daphile requires neither installation, nor any configuration before you put it to use. and can run even on 256MB RAM machines. If you want to turn an old machine into a music server, then Daphile is for you. Despite the range of elements that comprise a full-featured music system, Daphile’s interface is clean. Play music across different devices, rip CDs and enjoy radio across genres from different countries. » Daphile provides an easy interface form a music sewer, and achieves this task without much fuss or bother. Daphile provides an easy interface form a music sewer, and achieves this task without much fuss or bother.